A book titled The Stray Shopping Carts of Eastern North America: A Guide to Field Identification has been named as the oddest book title of the year. The annual prize, awarded by industry magazine Bookseller, drew more than 5,500 internet voters to its website. 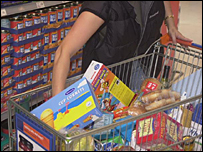 The shopping trolley book, by Julian Montague, picked up 1,866 votes. Tattooed Mountain Women and Spoon Boxes of Dagestan came second, with Better Never To Have Been: The Harm of Coming Into Existence in third place. "We are delighted to reward a brilliant piece of niche publishing again this year," said Joel Rickett, deputy editor of The Bookseller. "For everyone who has ever seen an abandoned supermarket trolley and wondered how it got there, The Stray Shopping Carts of Eastern North America is an indispensable guide." "The book is a labour of love and apparently took the author six years to compile," he added. Other runners-up include How Green Were the Nazis? and D Di Mascio of Coventry - An Ice Cream Company of Repute, With An Interesting and Varied Fleet of Ice Cream Vans. The contest began in 1978 - previous winners include High Performance Stiffened Structures, Living with Crazy Buttocks and How To Avoid Huge Ships.